I’ve had some time off from thinking, on account of the day job, but a recent minor event applied the jump leads to jolt me back into life, namely, Faith in the Age of Science got a rather good review, ( http://www.jesus4u.co.uk/reviews/faith-science-atheism-religion ) Even though my Christian humility is impressive, I couldn’t help feeling that perhaps my writing career was not over. However, it’s a couple of years now since I finished writing the book, and it’s a trifle depressing how little the whole faith and science scene has moved on. Did all the sound and fury signify nothing? After all, the atheists are still atheists, the fundamentalists are still fundamentalists, and the middle-of-the-roaders are still trying to dodge the traffic from both directions. The logic of the wager seems pretty sound – so why does it not carry more weight today among atheists? Even Richard Dawkins claims only that there almost certainly is no God. Well, I can be almost certain that my house will not be struck by lightning, but that doesn’t stop me having insurance just in case. I strongly suspect that atheists who take Dawkins’ line also have similar policies with reputable insurance companies. Since one’s potential destiny is unarguably more valuable than a potential property value (even in a period of house price inflation) why should the wager be thought irrelevant? There can only be, as far as I can see, one reason for this attitude among atheists. If they believe there is a chance (however small) that there is a God, yet make no provision for that possibility, they must be working on the assumption that they will not face any real difficulties should they meet up with that God in some dimension beyond those in which we currently exist. This attitude implies that atheists have already defined the nature of the God in whom they do not believe. That seems rather arrogant, even delusional – similar to defining the nature of lightning such that it cannot strike my property. It also seems rather meaningless. Anyone can define the nature of a God whom they do not believe exists. I suppose there must be an infinite number of possibilities that could be put forward. I fully confess to a lack of humility if I should get a good review on occasion, or even a half-favourable comment; but that does seem like small beer compared to that supposed knowledge of everything that feels able to lay down the parameters for what God could be like. It seems akin to defining the universe to fit with my own requirements. Since most atheists I know seem to be decent people, I shall not speculate further on motivation. I shall, however, when engaging in discussion, be sure to ask them about the scope of their home insurance policies. The problem comes down do defining exactly which god/s and forms of worship are necessary. As an outsider I see a plethora of different religions, most subdivided into smaller sects which may or may not agree on whether each other are damned forever or not. How do I even start to choose which one is leading to heaven? Will I be able to follow the teachings and traditions of my chosen religion to a sufficient level to satisfy the conditions for the afterlife? Some religion are easier to adhere to than others – is picking one of them “cheating” in some way or is it an easy way to boost my odds? It seems so unlikely that I’ll both pick the right religion and follow it correctly that it’s similar to a lottery. Sure, I believe that people do win it, but I don’t buy a ticket because I’m aware the odds are that I’ll lose. The equivalent is that if you’re almost certainly damned then you may as well cut your losses and just make the best of your life. Of course, you can interpret Pascal’s Wager as simply having a belief in a deity or deities, but even then we have to make the decision between mutually exclusive mono/polytheistic traditions. You are quite right, of course, in your first paragraph – and, incidentally, I think it would be appalling to choose between religious practices purely on self-interest. However, I only think that because I actually believe in a religion of the heart reaching out to God. It seems to me that the atheist, by definition, does not have that option. I’m intrigued that you assume almost certain damnation for making the wrong choice! Why should that be so? It would be equally possible to assume that even the slightest twitch of faith, however feeble or mistaken in many ways, might be enough to put us into a relationship with God. From that assumption I think my argument is valid. Interesting thought though – to what extent are the ‘religious’ responsible for giving the impression that their various versions of God are just waiting to cast everyone into hell? Congratulations Mark on the review. It sounds a good read. But nobody will read a book unless others know about it. I’ve just had a book published on a similar topic, and I realise that i have now become a marketer rather than author. http://www.independentauthornetwork.com They will set you up an author page (I have one) If you are on twitter, they will retweet to thousands of followers. (e.g. you could tweet with a link to the review). There are also other twitter sites who will retweet if you put their hashtag…. I’m still learning! Mark Silversides is author of Faith in the Age of Science, and comments on atheism and religion. Should we Shackle the Internet? Could Atheists Please Clarify What They Mean? 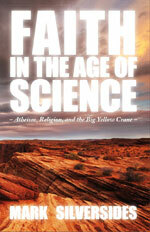 Buy "Faith in the Age of Science"